It is silly to want a fragrance just for the bottle, right? And it is even sillier if, like me, you don't keep your perfume bottles on display anyway. Mine are stored away in a dark cabinet, safe from the ravages of heat and light. You might think I open the cabinet frequently just to admire my collection, but you'd be wrong. I open it as rarely as possible, for as soon as I peek in, they all begin taunting me — HA, you'll never use me up before I spoil anyway. So I know how ludicrous it is to be in love with Pucci's Vivara just for its debonair exterior, but there it is. I*want*that*bottle. Not only that, I keep thinking how lovely it would be to have a whole series from Pucci: same bottle design, a different Pucci print on each cap, and each with its own jewel-colored juice. Wouldn't a whole row of them be just stunning? Needless to say, I tried hard to fall in love with Pucci Vivara the perfume and not just Pucci Vivara the bottle, but alas, it was not to be. The fragrance, which was developed by perfumers Natalie Gracia-Cetto and Marie-Aude Couture-Bluche, is described as a green floral with a "touch of the original Vivara's chypre accord" (the notes include galbanum, bergamot, amaretto accord, jasmine, orange blossom, narcissus, iris, vetiver and patchouli). It starts fresh (e.g., "fresh air" and "fresh water") and green, then moves into fresh and floral. The florals are sheer, and the amaretto accord is extremely subtle — this is not a gourmand scent, nor is it particularly sweet — but I found the combination of almond + the melon-ish aquatic note less than appealing. The base is pale and mildly earthy, and more clean than not. After a couple hours, it does darken a smidge, and it starts to take on a velvety patina from the iris. It isn't a bad scent, exactly, but I don't care for it personally and it isn't anywhere near so lively or engaging as its packaging. If you are a fan of fresh fragrances, you might like it much better than I did, in which case, can I have the bottle when you're done with it? 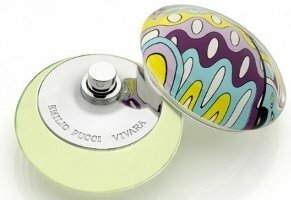 Pucci Vivara is available in 50 and 75 ml Eau de Parfum. There is also a matching Perfumed Body Mousse (see above) and a Perfumed Body Cream, and those jars are pretty darned lovely too. It is available now at Saks and Neiman Marcus. no, Robin like me, loved the design of the bottle. I thought the exact same thing about having all the colours just to look at . I haven’t smelled it though, no where sells it near enough to me. I lust for that bottle the way I lust for Palazzo, and it's just not meant to be. There's something in there that gives me the same whomp-upside-the-head feeling that I get from Sisley Soir de Lune. To me it's definitely more than “a touch” of chypre, and I think it's the combo with galbanum that does me in? Like SdL it's a scent I admire but can't imagine wearing. Palazzo is another major disappointment. Two best bottles this year, IMHO. It isn't the “touch” of chypre or the galbanum that spoils it for me — I would be happy with more of both — it is the aquatic & fresh notes. Don't know why I still admire New West which whacks you over the head with it, but almost nothing else with aquatic notes. The bottles were displayed on a low table, so that I was looking down at so many…blobs. I think they did that to show off the design in the cap, but from above the juice section looked flattened and unimportant. I also found the bottle difficult to hold and spray. The juice isn't terrible at all, just not that interesting. Aha, and Neiman Marcus had them up on a shelf at eye level. Wonder if that made a difference? It is a very squat bottle, and agree that it is not a comfortable shape to spray at all. Would agree on the scent — not terrible, just not that interesting. I got a chance to sniff this last week at Neiman's and because of that lively bottle, I was expecting an equally lively perfume. Sadly, the perfume does not live up to the bottle. Yes, it is such a pain, when you are just in love with the bottle. But realize that the fragrance does not work on you!! I tried the night poison form CD last weekend. The Amber just does not like me. It actually cause me headache!! I have all the poison range except this one! My heart was broken into pieces at that time honestly as I so desperate to collect all the poison bottle. Oh, that's too bad! Maybe you can find a mini of the Midnight Poison? Although I don't actually know if they do minis at CD. Actually, reading “fresh” plus amaretto made me feel a bit queasy. It makes me think of Missoni's fresh + chocolate or whatever that is that smells wrong to me. And there's no accounting for your feelings for an individual fragrance that does not in any way fit in with your regular lineup. It keeps your readers on our toes, it's always fun for me to guess whether you'd like something. What went wrong for you w/Palazzo? Did you just find it meh? Or did you get the Ghost of Big-Hair fragrance or whatever it was that scared me? And I swear it DOES smell like chocolate for awhile, although it's not listed in the notes, and that + the patch does conjure Angel in the middle of the development, I can see how people make that comparison. The packaging is wonderful, but the scent…oy! I suffered through it. ROFL at “Ghost of Big-Hair fragrance” — that's pretty close to the mark, and fittingly enough, it had some sort of Aqua Net thing going on too. But admittedly only gave it one quick try so far, and will give it another chance. If only they had poured Theorema in that bottle!! M, I tried hard to like the cream after I didn't like the fragrance, but no dice. Ah well. I have a mini of Hypnotic Poison that I just love, it's a great size. While I'm very fond of HP, a dab every so often is plenty for me. I could get by with a sample. Still want to try Midnight Poison, but have read only disappointing things about it. A mini, though, would be very cute. On the other hand, I too have a lust for the Palazzo bottle, and a penchant for big hair fragrances, so maybe it'll be a good match; haven't tried it yet. And I agree with you, R, this Pucci bottle is very fetching. Too bad the juice is dull. I haven't smelt this yet but I am dissapointed it seems nothing special. I was really looking forward to Palazzo though, I can't believe that's nothing special either, I was really excited for that. Oh well, you can't love them all!! Thankfully, I suppose! Well, as I said above, have only tried it once so far. Maybe it will turn out to be a surprise hit! You know, I'd like to have a mini of HP, will have to look for one. My favorite of the Poisons, although I do like Midnight Poison too (it is probably my 2nd fave of the bunch). I disliked that bottle intensely. And now I'm scared of sniffing the juice because I loved the original so much c.1973. Why, oh why, do they insist on resurrecting – and destroying – old scents? I pity people who have never smelled the original Je Reviens, Rumeur, etc., and judge those scents by their pale imitations. The fact that I have makes me feel better about being sooooo old. No, but it's still sad. Wow, wishing I had liked this one, espcially after the woman at Nordstrom's made me a decant (my first! I'm a perfumista in training). Something in there make my nose twitch – perhaps the “fresh water”? So now I have a vial of vile. Anyone want it? Congrats on your first Nordstrom decant, LOL! I absolutely love it!!! The scent and the botle! I always suffer when it gets hot in the City and the only perfume I was able to use was Chance Chanel. But after few summers with Chance I was getting bored.Then I discovered Vivara. It's beautiful, fresh, clean, not overhelming and it when it dries down there is something masculine about it. Maybe that's why I like it so much. Did you see the new silver limited edition bottle? Gorgeous! Why is it that when I decide to be liberal testing something new it turns out to be something like this?? I am having a minor scrub debate with myself but I think I'll ride it out. Funny thing is that when I smell myself, I somehow am smelling many women, like I have had women in my life who wore this (I get that with Mitsouko big time, but it is a more pleasant experience). Maybe smells like this are so prevalent in department stores that I associate it with well-coiffed shoppers. Anyway, I am not happy about this – too melon-y and aquatic. I'm glad it's chilly because if it was hot out I'd be in the shower now. I just stuck my arm under my housemate's nose and he made a face and said blecch, too strong. It's a shame — I *still* stop to look at the bottle every time I see it.